Each CD-ROM or DVD-ROM drive has a bipolar stepper motor. 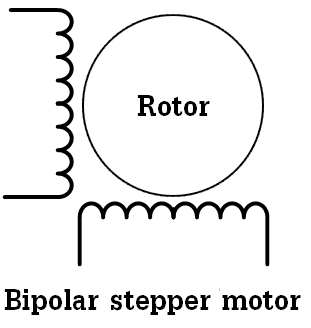 The bipolar stepper motor has 2 windings which means that this type of motors has 4 wires. 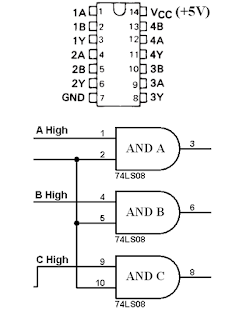 To control the bipolar stepper motor we need two H-bridge circuits and for that L293D motor driver chip is used, this cheap chip can work as a dual H-bridge drivers. The IR remote control used in this project is shown below with the used buttons and their codes which are used in the code. External interrupt is used for reading IR signals. if( (count > 199) || (count < 160))        // NEC protocol? if( (count > 99) || (count < 30))          // NEC protocol? if( (count > 13) || (count < 8))         // NEC protocol? if( (count > 39) || (count < 8))         // NEC protocol? The following video shows a hardware circuit for this project. 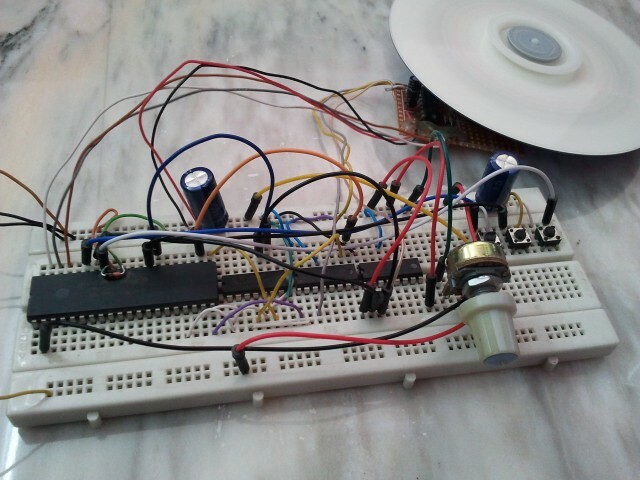 This project shows how to control a 5V unipolar stepper motor from IR remote control uses NEC protocol with PIC18F4550 microcontroller. 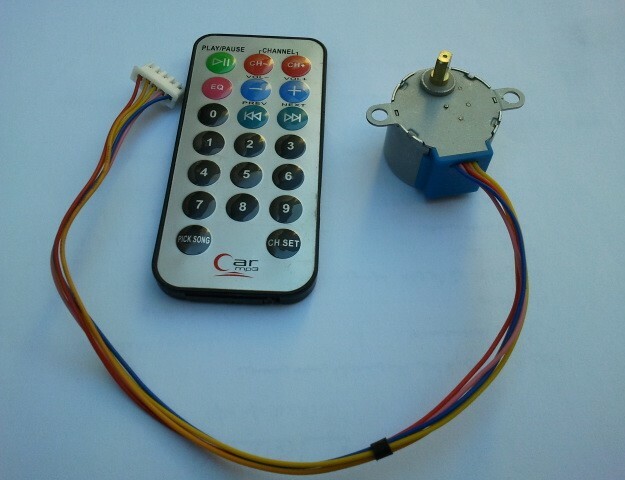 This controller controls the stepper motor speed and direction of rotation. To drive the unipolar stepper motor we need ULN2003 (ULN2004) Darlington transistor array or L293D motor driver as described in the previous topic. Project circuit schematic is shown below. PIC18F4550 microcontroller internal oscillator is used. External interrupt is used to read IR remote control signals. 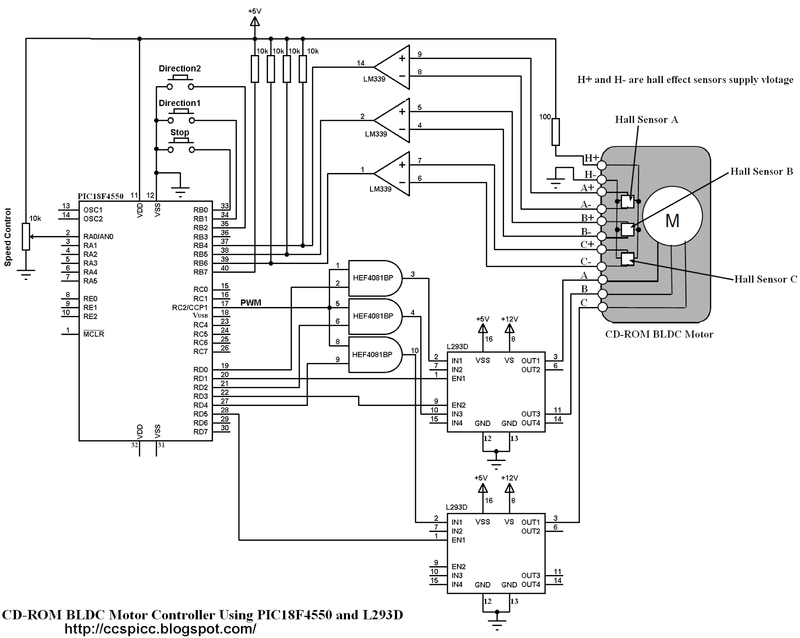 This topic shows how to make the same controller using L293D motor driver instead of the 3-phase bridge circuit. The 3 phase bridge is more complicated and expansive and while the L293D motor driver chip is a small, cheap and saves time. In this project we need two L293D chips because the BLDC motor is a three phase motor, and at any time two windings energized while the third one floating. In the circuit there are 3 buttons connected to RB0, RB1 and RB2. The buttons connected to RB1 and RB2 are used to start the BLDC motor and the other button is a stop button. The BLDC motor speed is controlled using a potentiometer connected to AN0 channel. There are 3 AND gates (HEF4081BP) in the circuit, these gates are used to get a 3 PWM signals from the original one which comes from RC2 pin using CCP1 module. HEF4081BP has 4 independent 2-input AND gates, three of them are used. This IC needs a supply voltage of +5V between pins 7 (GND) and 14 (VCC). PIC18F4550 microcontroller internal oscillator is used (8MHz). The following video shows project hardware circuit. 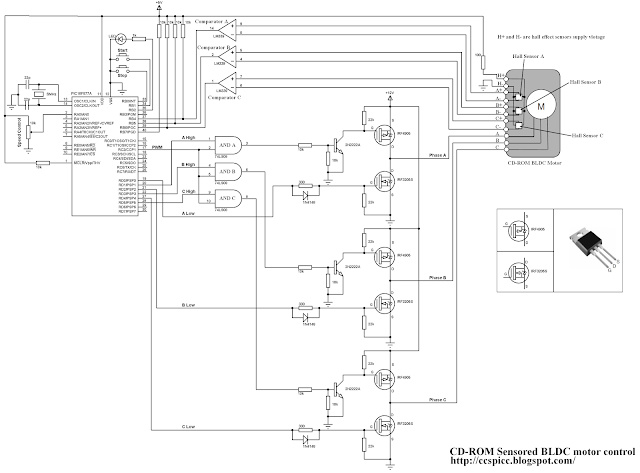 Microchip: Sensored BLDC Motor Control Using dsPIC30F2010 (AN957). Microchip: Brushless DC Motor Control Made Easy (AN857). I made a sensored BLDC motor speed controller using PIC16F877A and 3 phase bridge circuit. In this project we are going to see how to build a BLDC motor controller using the same microcontroller and L293D motor driver chip instead of the 3 phase bridge circuit. Each sensor outputs a digital high for 180 electrical degrees and outputs a digital low for the other 180 electrical degrees. 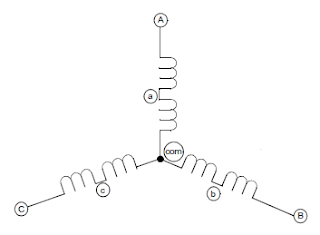 The following figure shows the relationship between the sensors outputs and the required motor drive voltages for phases A, B and C.
The 3 hall effect sensors needs 3 pins and for that RB4, RB5 and RB6 are used. 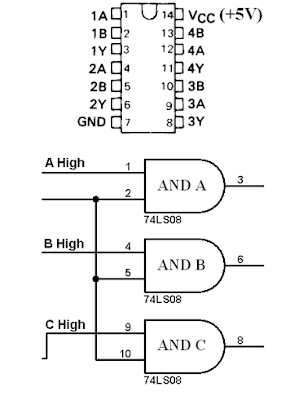 IN1, EN1, IN2 and EN2 are the 1st L293D pins which are respectively IN1, EN1, IN3, EN2. IN3 and EN3 are the 2nd L293D IN1 and EN1. 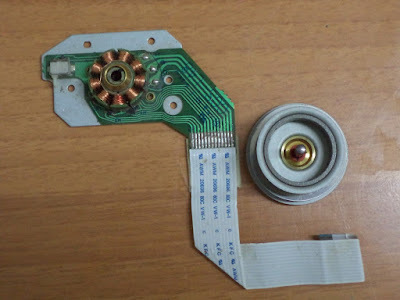 This topic shows an easy way for controlling cd-rom drive (or dvd-rom) spindle motor using PIC18F4550 microcontroller. There are different spindle motor types used in the cd-rom drives and the one used here is sensored brushless DC motor (BLDC motor), so be careful with your BLDC motor type and if it has less than 11 pins that means your motor is not concerned. This motor is three phase motor, it has three stator phases that are excited two at a time to create arotating electric field. This method is fairly easy to implement, but to prevent the permanent magnet rotor from getting locked with the stator, the excitation on the stator must be sequenced in a specific manner while knowing the exact position of the rotor magnets. A three phase bridge is used to energize the BLDC motor windings. 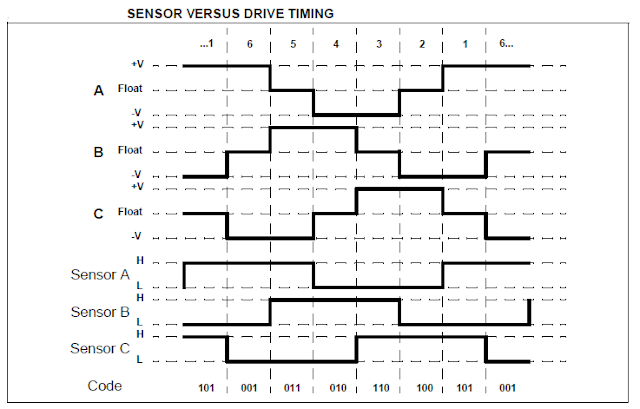 Each phase driver requires 2 pins one for the high side and the other one for the low side which means a total of 6 pins are required to drive the three phase bridge. In this project 6 pins of PORTD will be used. Rotation direction2 is accomplished by driving current through the motor coils in the direction opposite of that for rotation direction1. The following image shows project circuit schematic diagram. In the circuit there are 3 pushbuttons connected to RB0, RB1 and RB2. The buttons connected to RB1 and RB2 are for starting the BLDC motor direction1 or direction2, and RB0 button stops the BLDC motor. OUT+ and OUT- : sensor output pins. For the system power supply there is +5V and +12V. The +12V supplies the 3 phase bridge circuit which is the same as the motor supply voltage. This is the full code of this project. The code is small and not complicated. RB interrupt on change (IOC) is used to interrupt when the rotor changes its position. A potentiometer connected to analog channel 0 is used to control the BLDC motor speed in both directions. 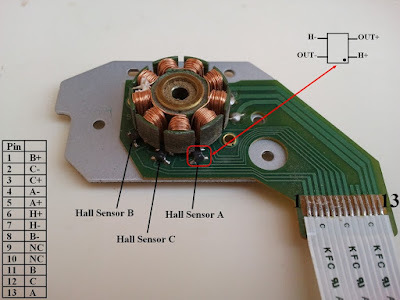 This topic shows an easy way to drive a Cd-Rom sensored brushless DC motor (BLDC motor) using PIC16F877A microcontroller with CCS PIC C code. The sensored BLDC motor has 3 hall effect sensors (Sensor A, Sensor B and Sensor C), this sensors sense the rotor position. Each sensor outputs a digital high for 180 electrical degrees and outputs a digital low for the other 180 electrical degrees. 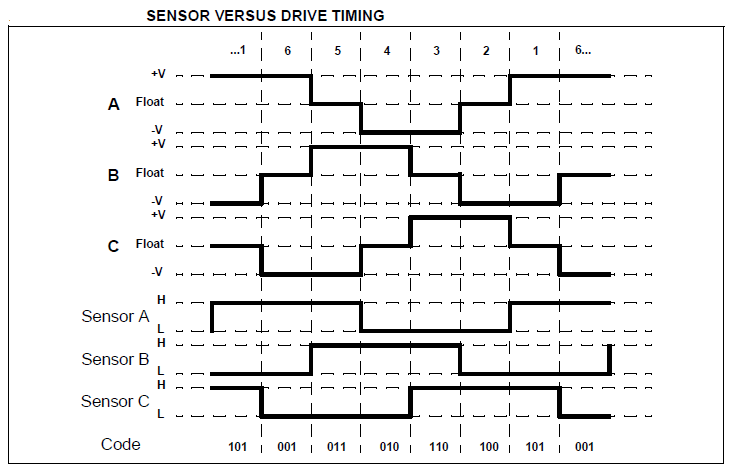 The following figure shows the relationship between the sensors outputs and the required motor drive voltages for phases A, B and C.
A potentiometer connected to analog channel 0 is used to control the BLDC motor speed. The PWM frequency is 500Hz and the duty cycle is related to analog channel 0 reading. The following video shows a hardware circuit for this project..
Logic 0: 562.5µs pulse burst followed by a 562.5µs space, with a total transmit time of 1125µs (562.5 x 2). Logic 1: a 562.5µs pulse burst followed by a 1687.5µs (562.5 x 3) space, with a total transmit time of 2250µs (562.5 x 4). The complete extended NEC protocol message is started by 9ms burst followed by 4.5ms space which is then followed by the Address and Command. The address is 16-bit length and the command is transmitted twice (8 bits + 8 bits) where in the second time all bits are inverted and can be used for verification of the received message. The following drawing shows an extended NEC message example. 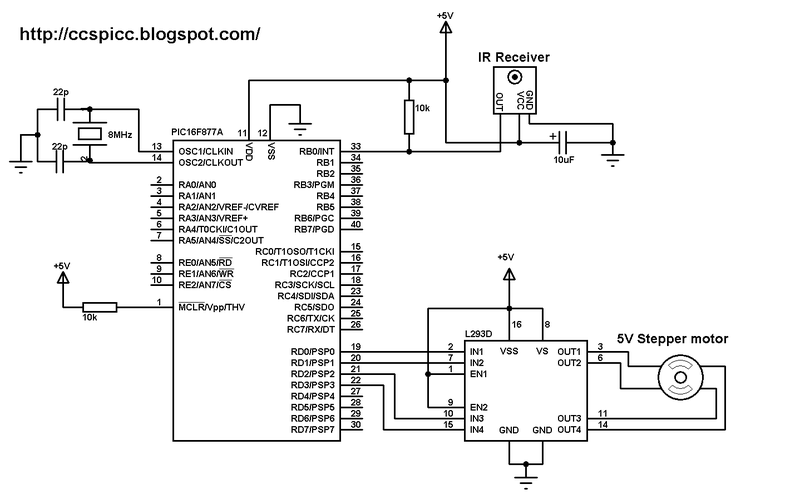 It is easy to decode IR remote control uses NEC protocol using microcontrollers. 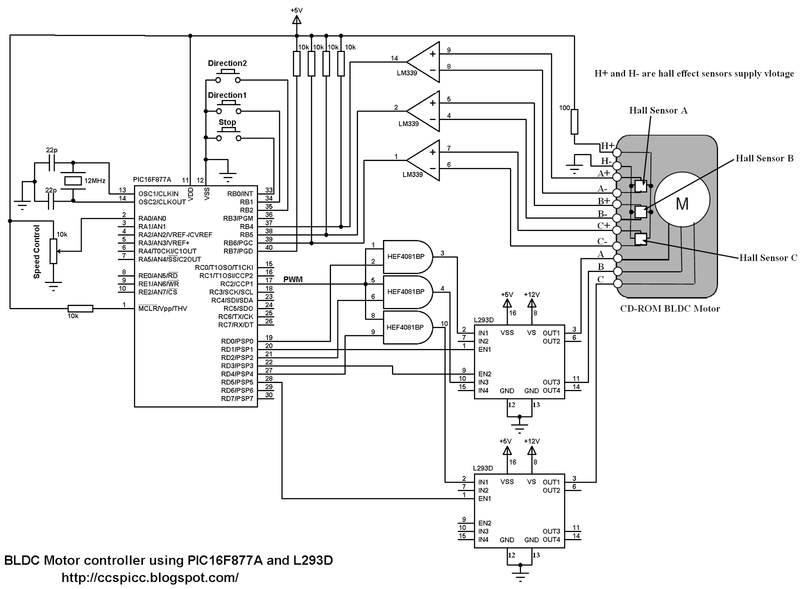 Here Microchip PIC18F4550 microcontroller is used to decode IR remote controls which uses NEC and extended NEC protocol. 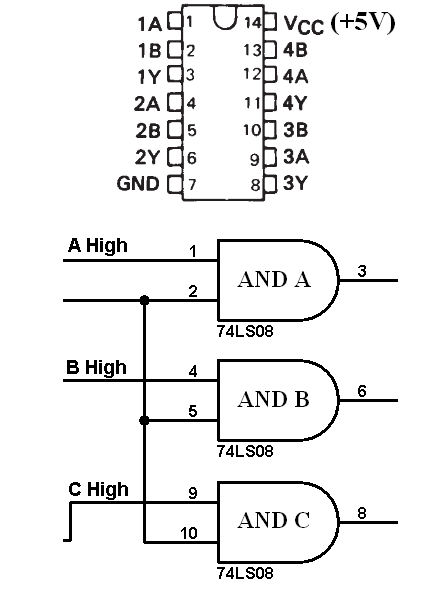 Decoder circuit schematic is shown below. In this project PIC18F4550 internal oscillator is used @ 8MHz. There are different ways to decode the NEC protocol for example using CCP module and Timer module, using Timer module or using port change interrupt........ In this project I didn't use any interrupt or Timer, I used delay command to make the code as simple as possible with time-out property and the code checks the IR signal with resolution of 50µs. From the decoder circuit schematic above the output of the IR receiver is connected to RB0 and when an IR signal is received RB0 pin goes from logic high (+5V) to logic low (0V). 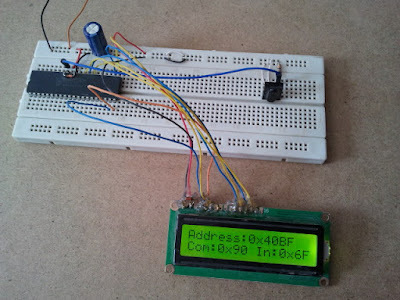 The NEC message has 32 bits which are divided into address (16 bits), command (8 bits) and inverted command (8 bits). After that a function named nec_remote_read() is called, this function checks if the received signal has NEC protocol form all the time. The last function reads the 9ms burst using the following lines and if the pulse is more than 10ms (50µs x 200) or less than 8ms (50µs x 160) the function returns with false result which means the received signal doesn't have NEC protocol form. After that the microcontroller starts reading the 32 bits and keeps checking of NEC protocol form. 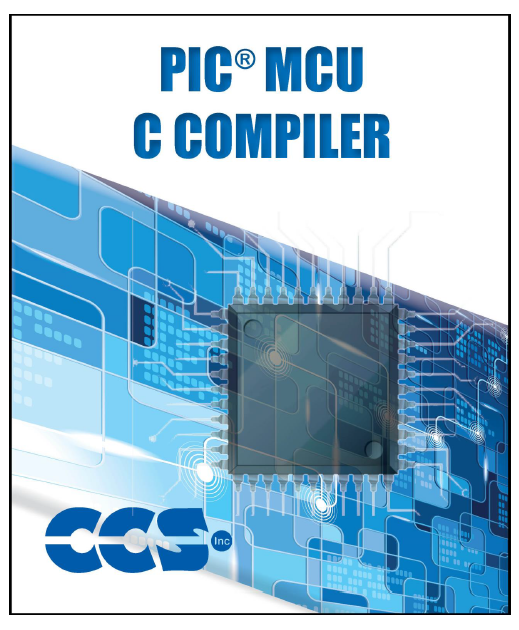 The following code is the complete CCS PIC C code written with compiler PCWHD version 5.051.
if( (count > 99) || (count < 60))          // NEC protocol? 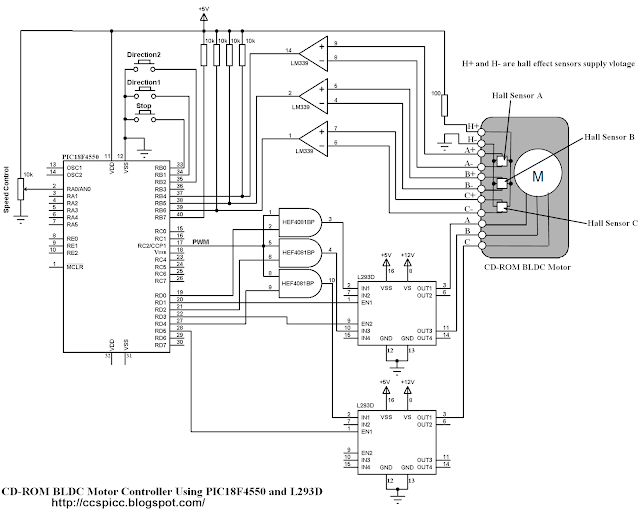 The following video shows how this decoder works in a hardware circuit.